Hrm, we need a spectator mode where players not in the game can see the stars that all players in the game can see. Jay, do you mean, have a menu list of on-going games to allow spectators to watch ? That would save me the difficult effort to keep track of game numbers. I think more players might join in to play, if they could first spectate some games. I meant that if all the players in the game can see a stars or fleets details, then perhaps spectators could see them as well. @HULK Are you going to keep the games active so people can analyse the previous games, or delete them as soon as they end? @JayKyburz If tournaments get popular and a spectation mode is added then eventually it would be fun to be able to replay a game back like a video. Probably only games marked with the tournament flag to save resources. @JayKyburz: YES, it would be very cool to have a “spectator mode” where other people can see stars/carriers that ALL players can see. Might be complicated arithmetically if number of players > 2 … but this would mostly be for tournament games anyway I think. Also, could you allow us to click on the players names and see their full stats such as Econ/Indy/Science plus tech levels. @xjhdexter: As you saw, I intentionally linked to the tournament games in the very first post with the idea being that people that wanted to check them out, could go there and just click. Yea, as mentioned, the @Luthias vs. @HOUSEBOAT_THANGS game is WILD! @AnnanFay: FYI that when I setup a “tournament” game for others (i.e. one that can start without me in the game), I “lose” control over it - doesn’t even show up in “My Games” … so it will stay until it rolls off … which I think is a couple of weeks. What about our game is so “wild”? The truth is I was dozing off and wasn’t really paying attention to my moves until you showed an interest. It must have been that bottle of Gomesian Ale that arrived anonymously in the mail the other day. . . Anyway, the trick to getting the upper hand when having to deal with houseboats is to time your attacks with the tides. . .
@JayKyburz , I agree with HULK. There will be very little to see from 64 player games in spectate mode. Reminds me of the Battle of Inchon . The entire thread is about 1v1 tournaments. I’m pretty sure this is the only context the suggestion was intended for. It’s a spectate mode so designed for tournaments. I seriously doubt the intention was was for it to be useful in all games. It would also be useful for 2v2 alliance tournaments and other two sided games. Speaking of which, maybe there could be games with automatic alliances from the start and where you can’t undo the alliance. Would be useful for NvN tournaments. 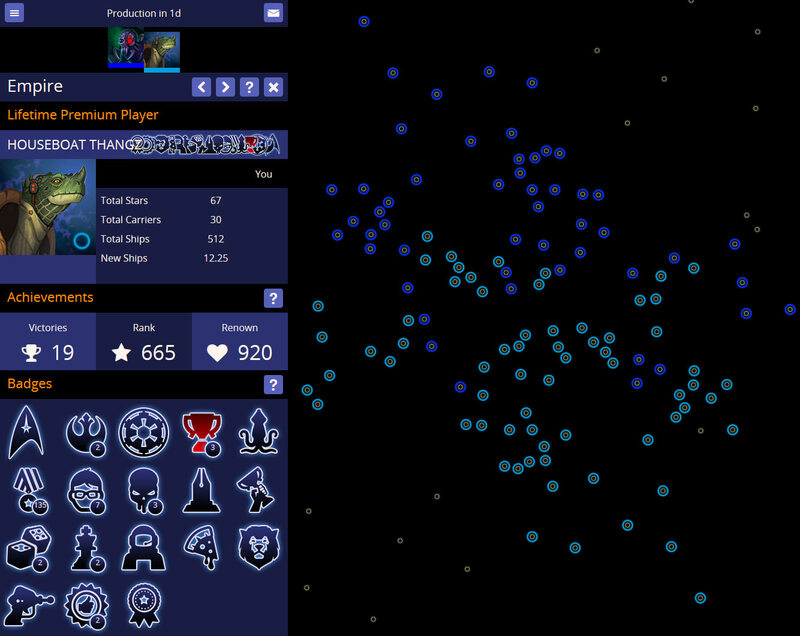 Just realized that @SuperDave vs. @Karmadrome (game link) they captured ALL of the stars. Looking at the stats, it is dead-dead even. Our game is dead even and we are producing 47 ships/hour. The trench is getting dug deep. I am trying to break free across “no man’s land” with a jump this last tick. I’m telling myself…one planet at a time. This galaxy is a tough one (too easy to defend). However, it brings up a good point to other players. As this tournament progresses, strategize for the “long game”. You aren’t going to roll over a player like HULK in 7 or 8 cycles in a fixed weapons game. Same with all tough players. This is a war that will be won/loss a little at a time. Warp gates, advanced Terra, Hyp 4+, etc. It’s all coming into play so plan accordingly. The WW1 trench warfare stuff definitely is a different twist. One of you will have to strike first and hard, then hope it all works out. In other news, I recommend we get rid of the 48 hour time limit. My game is moving sooooooooooooo slowwwwww. Update after finishing 10 cycles. We are even in planets as the galaxy is equally split and we are fortifying on our border. @Karmadrome 148 economy, 133 industry, 32 sciences, 5823 ships. Me: 170 economy, 132 industry, 32 sciences, 5620 ships. We are even in research, however, I have Terra 5 and he has Scanner 3. I tried to jump across the expanse with 1300 ships. Karma used warp gates to take me out. The result was I went from a 70 ship lead to a 200 ship deficit. He had to buy expensive warp gates (which he subsequently destroyed) and it cost him in being able to buy economy. Still very close. Needs several more cycles. LOL Good show ! Update. We have played 296 ticks now (12+ cycles) and the first planet has been officially captured.